Ludwig, aka Kiowa Lidwell, is a 5-year-old brindle male born May 22, 2006. His sire is Kiowa Sweet Trey and his dam is Flying Rachel. 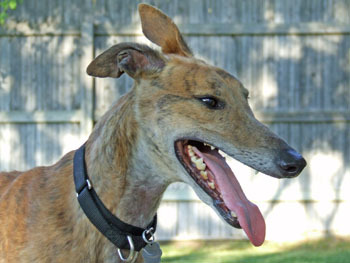 Ludwig has 53 races to his credit on Greyhound-data.com, starting November 30, 2007 and ending on January 2, 2010. 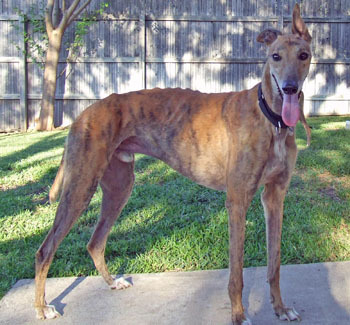 His whereabouts between then and his arrival at Fort Worth Animal Control as a stray are unknown. Ludwig was described as perky by the FWACC staff, and is a happy, tail-wagging boy. Ludwig tested positive to Ehrlichia when he arrived, and now after successful treatment, he is ready to find his forever home! Ludwig is cat and small dog tolerant. Hi! My name is Ludwig but my foster mom calls me "Louie" for short! 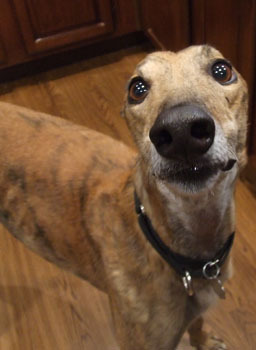 I am a very happy, very affectionate greyhound. I will lean on you anywhere and anytime! If you pet me long enough I almost fall asleep standing up with my eyes blissfully closed. I love scritches and ear rubs. I also love, love, love my toys! I recently discovered toys and they are my very favorite thing, right after petting and scritches. If they have a squeaky I will squeak them. If they are floppy I will shake them really hard! I like to take my toys and run from room to room with them, trying to find the perfect spot. I stay in a crate during the day when my foster mom goes to work, and I ride really well in the car. I like to go into the backyard and run with my foster brothers, and I love treats. Not as much as scritches, but pretty close. I would probably do better in a home without very small children, but I am fine with cats and small dogs. Do you have room in your home (and heart) for me?